Grzegorz Nawrocki is a graduate of International Studies Centre of the University of Cambridge, UK where he earned his Master of Philosophy diploma in European Studies. Prior to that, he graduated from Broadcast Journalism in Preston (Postgraduate Diploma, University of Central Lancashire, UK) as well as American Studies Center (Master of Arts diploma, Warsaw University, 1997) and English Philology (B.A., Jagiellonian University, Cracow, 1994). He is a laureate of British Chevening Scholarship (twice – in 1997 and 2001) funded by the British Foreign Office and a scholar of the Leader in Civil Society programme run by the Robert Schuman Institute in Budapest (2000). He completed a number of professional TV and radio attachments in the BBC and ITN in London and Manchester. From 2002 (with intervals) he has worked for Polish Public Television Channel 1 as a journalist and current affairs programmes’ presenter (e.g. “Interview of the Morning”, “Channel One Interview, and others). He specialized in interrogative interviews (he hosted many distinguished politicians, e.g. Pat Cox, Romano Prodi, Lech Walesa, Vicente Fox, Claus Fjord Frederiksen). Laureate of the professional stage programme by the British Council “BAS Top People Project” (2004) in BBC World Service in London (shadowing the director of the BBC WS). Occasionally he reports on selected issues for the BBC 5 Live. Professional placement completed with BBC World’s HARDtalk programme (2005) on interviews with international politicians including Hamid Awaluddin, Indonesian Justice minister or Jaap de Hoop Scheffer, NATO Secretary General. He is interested in the development of civil society in Poland. He ran a journalism workshop for European Summer Academy, Cologne, Germany. Privately, he is interested in drama and theatre. He chairs Oxford Style debates in Warsaw. He is a president of the British Alumni Society in Poland. 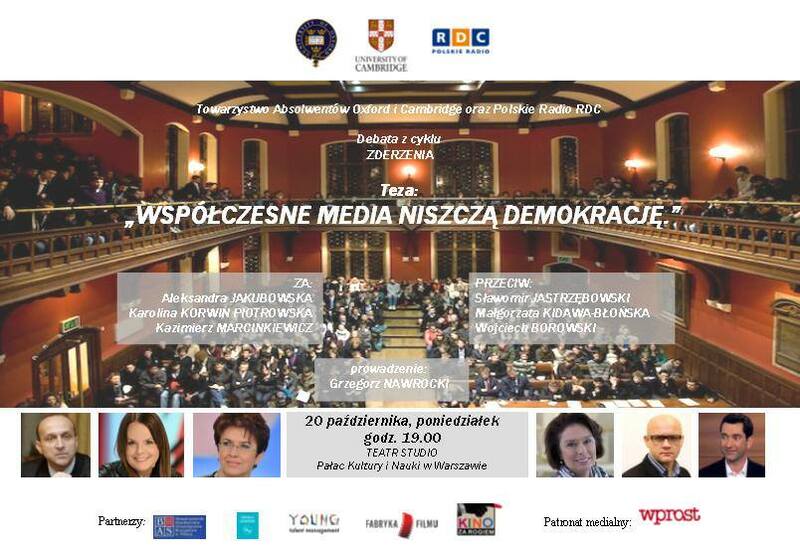 Leader and host of Oxbridge style debates by Oxford and Cambrige Society of Poland. POLcast is an English language podcast, a colourful audio magazine delivered directly to your smartphone, computer or tablet. POLcast is created for everybody interested in Poland. If you have a Polish customer, colleague, girlfriend or grandmother - you will hear something helping you to enrich these relations. Each episode brings you interesting interviews, historical facts, trivia and more.